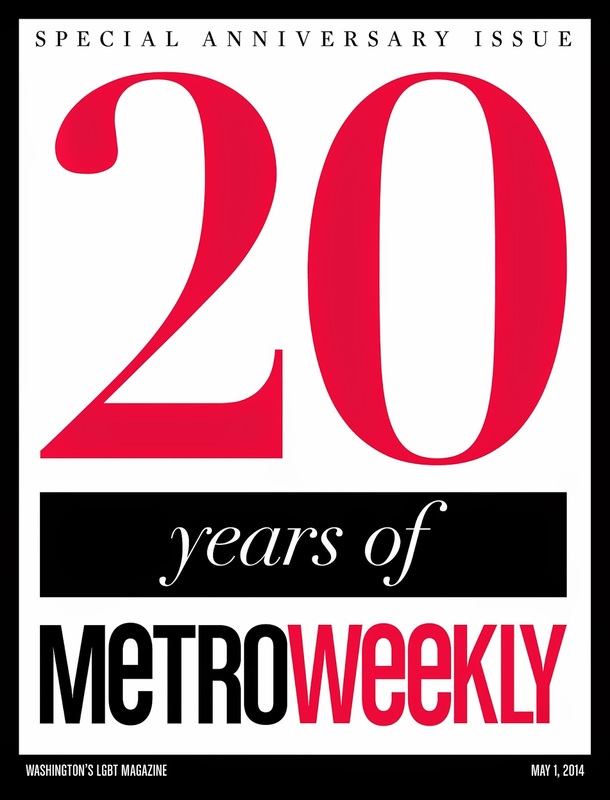 A glossy LGBT newsmagazine based in the nation’s capital achieved a significant milestone earlier this year when Metro Weekly celebrated its 20th anniversary. To mark the occasion, staffers published a 112-page commemorative issue featuring a retrospective spotlight on the publication’s history, including 20 interviews, 20 features and 20 questions pertaining to the magazine. The May 1 issue also contained two pieces looking back on the publication’s two decades worth of providing news, politics, opinion, arts and entertainment, and "Scene" photographs from events and venues. In fact, the “Scene” section has archived more than a 100,000 photos from Washington LGBT community events online. Over the years, changes came, including the name change (from Metro Arts & Entertainment Weekly to Metro Weekly), as well as changes in format (to full glossy magazine in the last few years). For Shulman and Metro Weekly, the advance of LGBT rights and the changing landscape of LGBT equality played pivotal roles, featuring prominently in the publication’s coverage at the same time the media landscape transformed rapidly and significantly. For his part, Sean Bugg, who over the years served as both the magazine's editor and co-publisher, offered a first-person perspective. “Twenty years ago when Metro Weekly first came off the press, it was a lot like me at the time: a little slapdash, bursting with energy and a bit naïve,” he wrote in the anniversary issue. “I mean all those things in a good way — it was slapdash because we had an idea for a magazine and simply decided to plow ahead. It was a moment when naiveté paid off because the young rush in where experience fears to tread. “We went by our nickname ‘MW’ in those days, one of the many ways in which the magazine then is different than the magazine today. It was smaller then, designed for easy pick up in the days when our distribution was limited to bars, restaurants and a couple of retail stores. It was black and white with spot color — ‘spot color’ being a difficult concept to explain to a generation that grew up with home printers that output high-res rainbows in seconds flat. During a telephone interview, Bugg said he was “very proud” of the staying power of the magazine that “went through a lot of evolutions. We have done things with a non-traditional attitude. That attitude and the focus on writing and stories that are interesting and entertaining,” he added, distinguish Metro Weekly and explain the role it plays in the nation’s capital and beyond. At the end of 2013, Bugg left Metro Weekly and is now executive director of the Next Generation Leadership Foundation. He remains the magazine's editor emeritus and an occasional contributor. Metro Weekly publishes every Thursday with a circulation of 17,500. BAY AREA REPORTER, based in San Francisco, has moved its offices to the city’s upper Market area, at 44 Gough Street, Suite 204. Since last fall, BAR had been housed in the downtown offices of SF MEDIA COMPANY, parent of the SAN FRANCISCO EXAMINER, SAN FRANCISCO BAY GUARDIAN and SF WEEKLY. 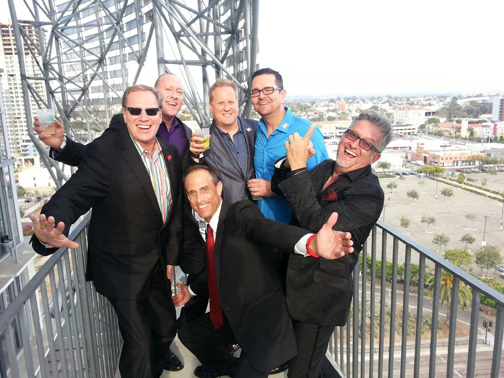 THE BILERICO PROJECT (BILERICO.COM) celebrated its 10th anniversary on Sept. 27, 2014. JONATHAN BUGG is the new editorial director of DAVID ATLANTA. COMPETE MAGAZINE, based in Phoenix, Ariz., has launched a Southern California edition called COMPETE SOCAL. BRIAN DEWITT has retired from his position as associate editor of Cleveland, Ohio-based GAY PEOPLE’S CHRONICLE. He has been part of the newspaper’s staff since its founding in 1985. GAY PEOPLE’S CHRONICLE, based in Cleveland, Ohio, entered its 30th year of publication with its July 11, 2014, issue. THE LESBIAN NEWS, based in Torrance, Calif., entered its 40th year of publication with its August 2014 issue. MULTIMEDIA PLATFORMS LLC, publisher of FLORIDA AGENDA and GUY MAGAZINE, has moved its corporate headquarters to Fort Lauderdale from Wilton Manors, Fla. THE NATIONAL LESBIAN AND GAY JOURNALISTS ASSOCIATION (NLGJA) announced its new board of directors. It includes president JEN CHRISTENSEN (CNN), vice president of print and online SARAH BLAZUCKI (Peace Corps, formerly of PHILADELPHIA GAY NEWS), vice president of broadcast KEN MIGUEL (KGO-TV, ABC), treasurer SHARIF DURHAMS (MILWAUKEE JOURNAL SENTINEL), secretary ROBIN PHILLIPS (REYNOLDS CENTER FOR BUSINESS JOURNALISTS), TREY GRAHAM (freelancer), BIL BROWNING (BILERICO MEDIA), TYLER CHANCE (GANNETT), FIONA DAWSON (TRANSMILITARY), STEVE ROSEN (STAR GROUP), MATTHEW BERGER (FOUNDATION FOR THE DEFENSE OF DEMOCRACIES), SUE GREEN (ARIZONA STATE UNIVERSITY), RICK STUCKEY (NBC Chicago), and JEFF TRUESDELL (PEOPLE MAGAZINE). KARA J. PHILP is the new managing editor of Phoenix, Ariz.-based ECHO MAGAZINE. QNOTES, based in Charlotte, N.C., held its first annual QList—Best of LGBT Charlotte Awards Reception on July 17, 2014. RAGE MONTHLY, based in San Diego, Calif., was named Outstanding Publication for the fourth consecutive year by the Nicky Awards, one of the West Coast’s oldest LGBT community awards. MEGAN RAPINOE, a midfielder for the Seattle Reign in the National Women’s Soccer League and a member of the U.S. women’s national team, was the guest editor of THE WASHINGTON BLADE’s second annual sports issue published on August 22, 2014. WIRE MAGAZINE, based in Miami, Fla., has launched WIREMAG, its new branding strategy that will include its print, digital and online content. During the main convention, attendees heard keynote speakers, panelists, and workshop leaders address a variety of topics, including diversity coverage of the LGBT community, the intersection of activism and religion, coming out in professional sports, and trends in social media. A one-day summit focusing solely on LGBT media featured two plenary sessions, one on how to better cover transgender persons and issues and another on the future of journalism funding. Breakout sessions focused on HIV/AIDS coverage in LGBT media, the future of lesbian media, out athletes and sports reporting, African Americans in LGBT media, and the future of blogging, social media, and mobile reporting. The opening plenary, “Transgender Journalists and Transgender Coverage in LGBT Media,” was moderated by Fiona Dawson and featured journalists Gretchen Rachel Blickensderfer, Christina Kahrl, Parker Molloy, and Andre Perez. Nonetheless, Chicago-based sports journalist Kahrl, who works for ESPN.com as an editor and writer, sounded a cautionary note. A focus on transgender coverage at the media summit notwithstanding, a variety of diversity issues rolled over into the main convention when the opening panel tackled hits and misses in covering the LGBT community. Cathy Renna, who moderated that session, said without a doubt, “The biggest issue for media — mainstream, LGBT media, and social media — is diversity. The issue is really about inclusion. Are we really looking at the way our community reflects the larger culture and our issues? There is no such thing as a gay issue or LGBT issue anymore. They are human rights issues [with] so many intersections, and we are missing so many stories. I think it was perfectly natural that everything we talked about at [the media summit] came up during the main convention discussion about diversity." Renna offered her thoughts on key takeaway messages from the LGBT Media Summit. A host on Sirius XM Radio and editor-at-large for Huffington Post, Signorile recently completed a book, “It’s Not Over: Getting Beyond Tolerance, Defeating Homophobia, and Winning True Equality,” to be published next spring by Houghton Mifflin. Sarah Toce, founder and publisher of The Seattle Lesbian, said being “all in this together” was an important takeaway message. Toce and Baim, along with Trish Bendix, a Los Angeles-based writer and managing editor of AfterEllen.com, led the panel discussion, “The Future of Lesbian Media,” during the summit. One mainstream press reporter, Jeremy Fox of The Boston Globe, found the NLGJA gathering important for his work. “One of the great things about the LGBT Media Summit, and the conference more generally, is hearing so many voices that I don't usually get to hear while trying to serve a wider audience that may not have a good understanding of issues in the LGBT community or even know that there is not one monolithic community, but many smaller communities that recognize common struggles and try to support one another,” he said. 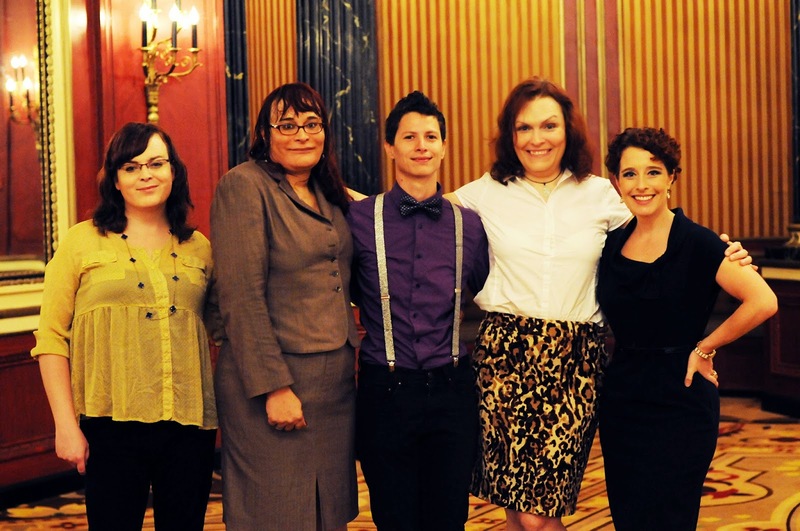 Next year, the National Lesbian & Gay Journalists Association celebrates its 25th anniversary. The convention is scheduled for Sept. 3-6 in San Francisco. Windy City Times’ coverage of the media summit and main convention, which includes video clips of various panels, plenaries, and awards reception, is available at http://www.windycitymediagroup.com/lgbt/LGBT-journalists-convene-in-Chicago/48742.html. CHICAGO — The National Lesbian & Gay Journalists Association added two more members of LGBT media to its Hall of Fame roster. They are Tracy Baim, publisher and executive editor of Chicago’s Windy City Times, and veteran journalist Lisa Keen, founder and chief correspondent of Keen News Service, which specializes in national legal and political news and provides such content to LGBT news organizations from coast to coast. Another 2014 inductee was Donna Cartwright, a veteran copy editor at the New York Times, also a longtime transgender LGBT and labor activist. 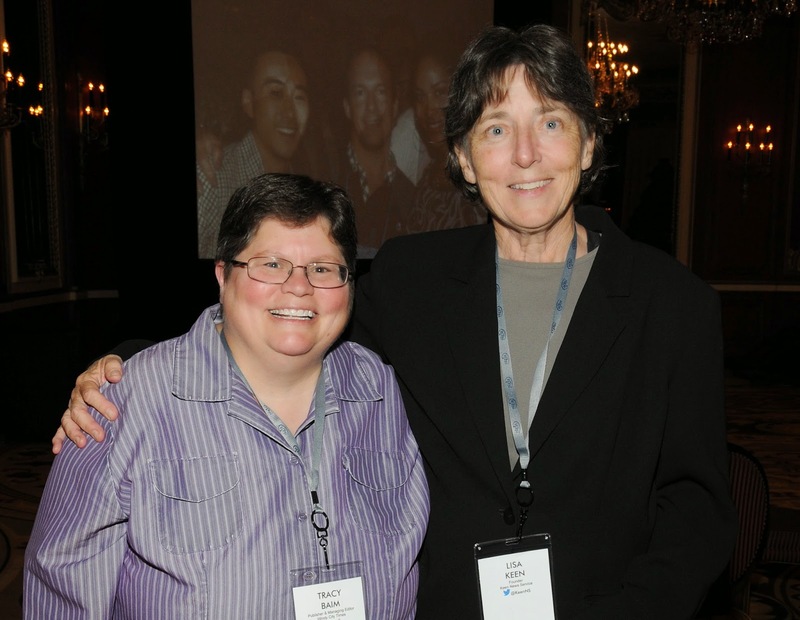 NLGJA made its formal Hall of Fame inductions on Saturday evening, August 23, during the closing awards reception at the organization’s national convention in Chicago. Baim and Keen were on hand to receive their respective honors. An author, filmmaker, and historian, in addition to publisher and editor, Baim began her career at Gay Life newspaper in 1984, a month after graduating from Drake University. She co-founded Windy City Times in 1985 and Outlines newspaper in 1987. Lambda Publications, the parent company of Outlines, bought Windy City Times in 2000 and merged it with Outlines, and the parent company became Windy City Media Group. NJGLA selected Tracy Baim in part for her lifelong passion for journalism and love of history, as well as her fierce human-rights advocacy. To that end, Baim has championed equality in battling sexism, racism and homophobia. For example, she received NLGJA’s 2014 first-place award for excellence in opinion/editorial for "The content of our character: Trayvon and us." “NLGJA, while it did not originally embrace LGBT media as part of its mission, has really changed that in the past decade,” said Baim. “They have honored several LGBT media people, including Mark Segal of Philadelphia Gay News last year. So it was a great honor to be inducted into the NLGJA Hall of Fame this year alongside Lisa Keen and Donna Cartwright. In brief remarks at the awards reception, Baim also voiced praise for the important role NLGJA has played in the LGBT rights struggle. For more than 35 years, Lisa Keen has been reporting news for LGBT audiences and is frequently considered the dean of gay political reporting in America. During her career, she served for 18 years as editor of one of the nation’s most respected gay publications, The Washington Blade. Keen was one of the first two reporters for a gay newspaper to be credentialed to cover the White House and Congress. She has covered U.S. Supreme Court cases since 1985 and is one of the only reporters to carefully analyze gay voting trends in presidential elections. In addition, Keen won the Silver Gavel Award from the American Bar Association for her coverage of an anti-gay initiative in Colorado and the subsequent landmark U.S. Supreme Court decision in Romer v. Evans, as well as a Society of Professional Journalists award for her series of interviews — from diagnosis to death — with one of the first gay men to develop AIDS in the early 1980s. Keen is also co-author of :Strangers to the Law: Gay People on Trial,” published in 2000. NLGJA selected Lisa Keen in part for her tireless commitment to reporting stories that matter most to LGBT people. In brief remarks at the awards reception, Keen spoke of the role LGBT media has played over the decades. Back in the 1980s and ‘90s, she said, a gay newspaper, like the Washington Blade, “was critical to the community. It was a matter of life and death” during the HIV/AIDS epidemic. In 2005, NLGJA established the LGBT Journalists Hall of Fame to recognize journalists for their commitment, courage, and dedication to LGBT issues in the media. Since then, NLGJA has honored a total of 25 journalists in the LGBT community.